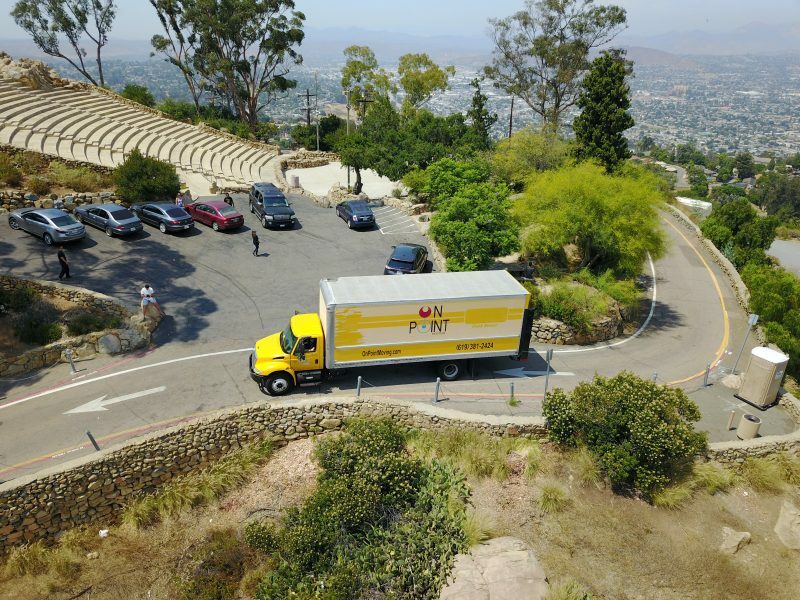 If you are in the market to move and are thinking about hiring a mover in the state of California, you need to be aware of what is included in your moving cost. 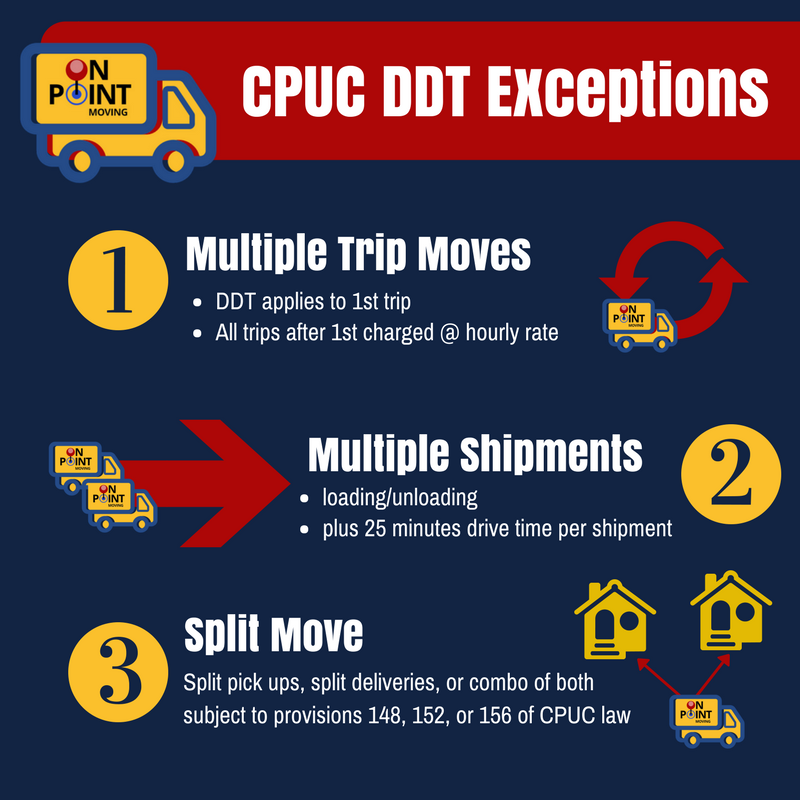 California Public Utilities Commission (CPUC) law requires all California movers to charge a double drive time (DDT) rate to their customers. What is the Moving Cost for Customers? 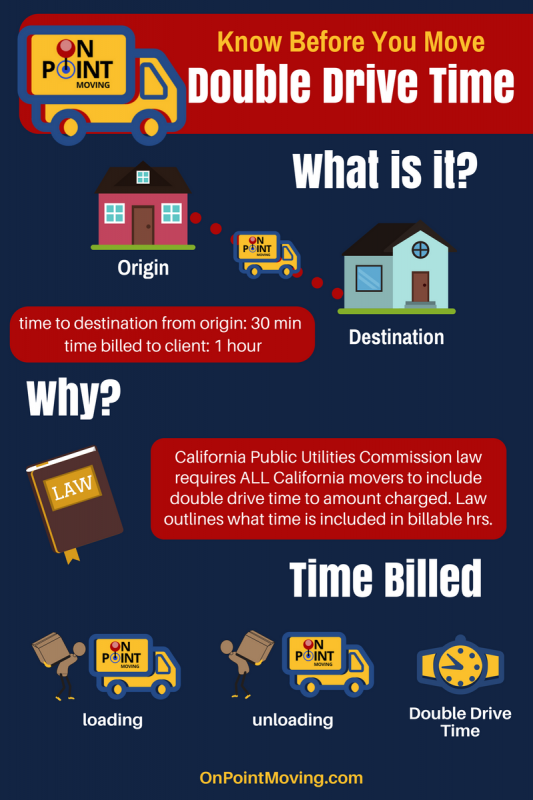 CPUC law states that time used and billed to customer shall include the total time to load truck, unload truck, and double drive time from the point of origin to point of destination. All California movers are required to abide by CPUC laws which means you will find this charge for all moves within California. What is considered origin and destination? Origin: address you are moving from; movers should not be charging for time used driving to origin from warehouse. Destination: address you are moving to; drive time back to warehouse should not be included in this charge. The time billed to customers is charged at the mover’s hourly rate. Some movers will round to the nearest 30 minutes. If you are unsure what your mover’s policy is, ask. Make sure you understand origin, destination, and what your mover charges per hour before entering into a move agreement. Believe it or not DDT was created by the CPUC to protect the customer. It keeps moving companies honest and keeps the customer aware of the true moving cost. Customer only charged for the process of moving their home not drive time to/from warehouse. Within the CPUC law exist three stipulations to double drive time and other costs that are passed down to the customer. Want to learn more about DDT Exceptions? Double drive time applies to first trip; all additional trips will be billed at actual drive time. If the move includes split pick up, delivery, or both in combination, then the move is subject to provisions of items 148, 152, or 156 of CPUC law. Before you move make sure you understand what time you will be billed for and what should not be included in your bill. Make sure you hire an On Point mover and rest assured that your move will be professional from the handling of your belongings to accurate moving cost.